Offshore Fishing with Capt. William Bradford - 40ft. Yellowfin--Triple 350 Yamaha. 1900.00 Plus fuel. Fuel Avg. is 600.00. Capt. 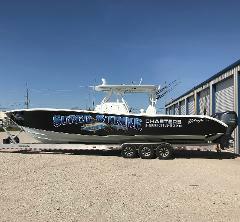 William Bradford has been working for Super Strike Charters since 2010 and has been fishing the Venice area since 1995. He runs both Offshore and Inshore charters for all Venice has to offer. OffShore Fishing with Capt. Scott King- 40ft. Yellowfin--Triple 300 H.P. Yamahas. 1900.00 plus fuel. Fuel Avg. is 600.00. Offshore fishing with Capt. Scott King on a 40ft. Yellowfin CC with triple 300 Yamahas. Capt. Scott fishes year round targeting species such as Yellowfin Tuna, Wahoo, Dorado, Marlin, Swordfish, Snapper, Grouper, Cobia, and Amberjack. Offshore fishing with Capt. Alan Balladares. on a 36ft. 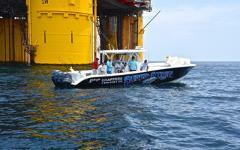 Yellowfin powered with triple 300 HP Yamaha 4-strokes. He has been fishing and hunting in Venice, La. for over 13 years. Inshore Fishing with Capt. Stephen Crews--25ft. Black Jack Bay-350 HP Mercury. Inshore Fishing for Red Fish and Speckled Trout in and around the tidal bays and jetties. Targeted species are Red Fish, Speckled Trout, Sheepshead, Drum, and Flounder. Inshore Fishing with Capt. Damon McKnight--24ft. Yellowfin Bay-350 H.P. Mercury Verado. Inshore Fishing with Capt. Ronald Hindman--24ft. 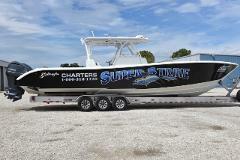 Blue Wave Bay Boat-300 H.P. Yamaha. Inshore Fishing for Red Fish and Speckled Trout in and around the tidal bays and jetties. Targeted species are Red Fish, Speckled Trout, Sheepshead, Drum, and Flounder. We have 4 boats available for large groups.